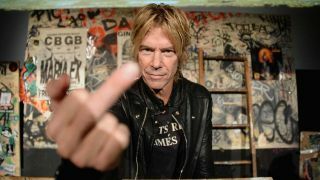 Duff McKagan has been there, done that, and bought the t-shirt. Homer Simpson’s favourite beer was even named after him. He started out as a young punk in Seattle, laying down the grass roots of grunge in 10 Minute Warning before moving to Los Angeles to find fame in one of the biggest bands of all-time, Guns N’ Roses. Since leaving the band in 1997, he’s performed with the likes of Velvet Revolver, Jane’s Addiction, Loaded and Walking Papers, and eventually rejoined GN’R in 2016. He’s also published two novels, and in 2011 he even founded a management company [Meridian Rock] that educates musicians about their finances.